Airbnb, the lease-a-room phenomenon, was started by a couple of room mates in 2008. It all started because they were having a hard time paying rent. They came up with an idea to set up a few air-mattresses in their living room and see if anyone would rent a night’s stay. Along with the night’s stay, they would serve their guests breakfast. So they set up a simple website so that people could register. They soon had their first guests who paid $80 for a night’s stay on their air-mattress and a free breakfast. Not long after, Airbed and Breakfast (Airbnb) was officially launched. Now I imagine that leasing out a room or space in your living room can be somewhat nerve racking, especially if you get a bad house guest. What if the person who leases your room is high maintenance? What if they are incredibly messy? What if they are diabolically evil and are hatching a plan to destroy your house? Okay, that was a little far-fetched. But what if? Well, if that was the case, you’d be a fool to lease them a room. Why would you lease a room out to someone who wants to ruin you? Nehemiah 13:4-5 4 Before this, Eliashib the priest had been put in charge of the storerooms of the house of our God. He was closely associated with Tobiah, 5 and he had provided him with a large room formerly used to store the grain offerings and incense and temple articles, and also the tithes of grain, new wine and olive oil prescribed for the Levites, musicians and gatekeepers, as well as the contributions for the priests. Eliashib took a sacred room in the house of God and put it on Airbnb. Then he leased it to Tobiah. Tobiah! This is the guy who ridiculed Nehemiah and the Israelites who came to rebuild the wall. He opposed the very work of God in Jerusalem. He was a troublemaker and a mocker. In the story of Nehemiah, he was a bad guy. Yet, he was allowed to sublet a room in the house of God. It’s preposterous! As ridiculous and foolish as it may sound, so many of God’s people are subletting rooms to bad guys. You see, we are called the house of God. We are to be a place that God dwells. Unfortunately, there are people that have taken their house and placed a room (or rooms) on Airbnb. And in those rooms, they are letting the devil reside; they have given space to the bad guy. When we do this, we are allowing him to make a mess of our souls. But we leave him there as we refuse to deal with our sin, our offenses, our addictions, and our pride. We give him space to roam in our hearts when we decide that the world’s way is better than God’s way. So what do you do? Nehemiah responded this way in verses 8-9: I was greatly displeased and threw all Tobiah’s household goods out of the room. I gave orders to purify the rooms, and then I put back into them the equipment of the house of God, with the grain offerings and the incense. He stepped in with the authority he had and kicked Tobiah right on out of there. That guy’s voice would not remain in the house of God any longer. His influence would not pollute worship to God. Tobiah didn’t belong in the house of God and the devil doesn’t belong in yours. So stand in the authority of Jesus today and kick him out. Ask a friend to pray with you. Deal with the bad guys that you have leased space to. Clean your house friends – you will be glad you did! 1 Kings 8:10-11 10 When the priests withdrew from the Holy Place, the cloud filled the temple of the LORD. 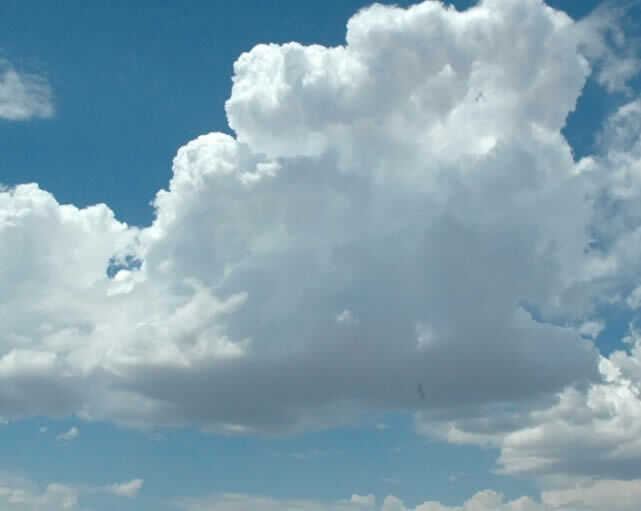 11 And the priests could not perform their service because of the cloud, for the glory of the LORD filled his temple. I love this! Solomon finished building the temple and brings the ark (presence) of the Lord into it. The presence of the Lord descends onto the temple physically in a cloud. It was so thick, they couldn’t have church! Imagine their surprise as they tried to perform the ceremonial duties as required by the Lord. They wanted to make the sacrifices, say the prayers, and read the scriptures. But the presence of the Lord was too thick! Today, most churches have a plan as to what their Sunday service is going to be like. There is a planned out worship set and a planned out sermon. Don’t get me wrong, I am not saying that those things are not inspired and anointed by God. Worship and the Word are good things! But what would happen if the presence of God came so strong that it began to mess up the plans? What if His presence was so great, we couldn’t have church? Would we forge ahead with our structure and plans, or would we allow the presence of God to put us in awe of Him? Sometimes, I think churches administrate God right out of their services. Yet He is what they are supposed to be about. David wrote that better was one day in His courts than a thousand elsewhere. And I say that better is one day at church basking in the presence of God than a thousand days at church where He doesn’t show up! If the church (and the church service) is going to be effective, He needs to show up! This should be our main concern: that the glory of the Lord fills the temple. I love it when God ruins the plan on Sunday mornings. It’s His church, His people, and His plans… not mine. As a pastor, I must keep this perspective. As His people, we must pursue the same in our own lives. Invite His presence to live each day in you. Plan for a cloudy forecast and cancel your religion. It will change everything! 1 Kings 7:45-47 All these objects that Huram made for King Solomon for the temple of the LORD were of burnished bronze. The king had them cast in clay molds in the plain of the Jordan between Succoth and Zarethan. Solomon left all these things unweighed, because there were so many; the weight of the bronze was not determined. This was one ornate temple that Solomon built. Our text in chapters 6 and 7 are very detailed as to what went into it. We have silver, gold, and …. pomegranates? I guess they were a big deal back then. Everything was measured carefully. We know its height, length, weight, and shoe size. But we will never know about the bronze. There was just too much of it. Now that’s one shiny temple! There were so many bronze pieces that it was nearly impossible to measure, we read. While that statement may not seem that significant, it tells us something about the provision of the Lord. You see, as Solomon set out to build the Lord’s temple, he had very specific instructions. Basically he needed a whole lot of supplies. And here’s the thing: God supplied all of his needs. He supplied them to the point that he could no longer keep track of how much provision there was. As we walk in the Lord’s will for our life, I believe we will discover the same thing. God will pour out His blessings on us to the point of not being able to keep track. That may look like an overflow of money or maybe an overflow of peace. Shoot, I have friends with an overflow of kids. I’m not sure how they keep track! 🙂 But God will overflow in our lives as we pursue Him. I have experienced His goodness and want to shout it from the rooftops! 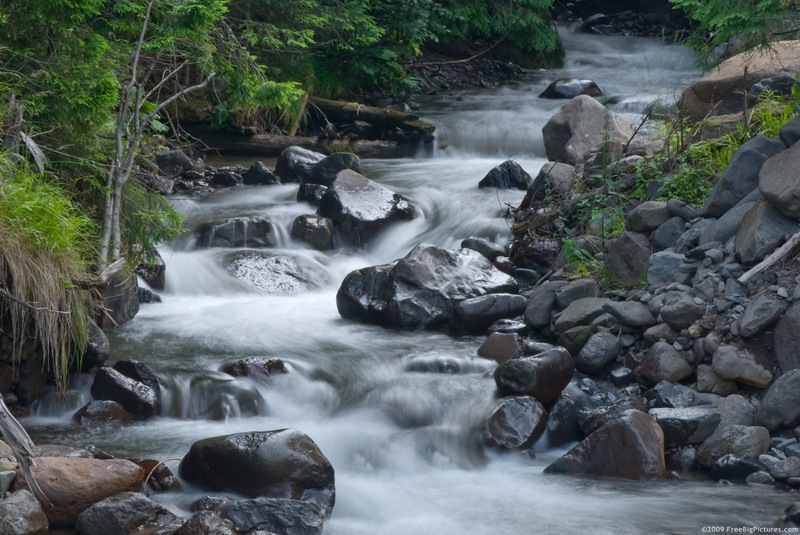 So let’s pursue God with our whole lives today and ask for HIS overflowing provision. Solomon built the temple and it only took him one chapter of the Bible to build it. We I think about it in those terms, that seems pretty fast. But the temple took quite a bit longer to build than the time it took me to read this chapter. It took seven years! You see, temples aren’t built overnight. They take time and energy. That doesn’t seem very appealing, does it? We live in a society that thrives on instant gratification. When we go out to eat, we expect our food in 10 minutes. (If it is fast food, we expect it in 2 minutes. Two minutes people. We are eating food that was prepared in 2 minutes. You can’t even cook Top Ramen that fast!) We work out 3 times and wonder why we haven’t lost those 10 pounds. I used to expect my computer to get me to the correct internet site within about 2 seconds; now I expect my phone to do the same thing. 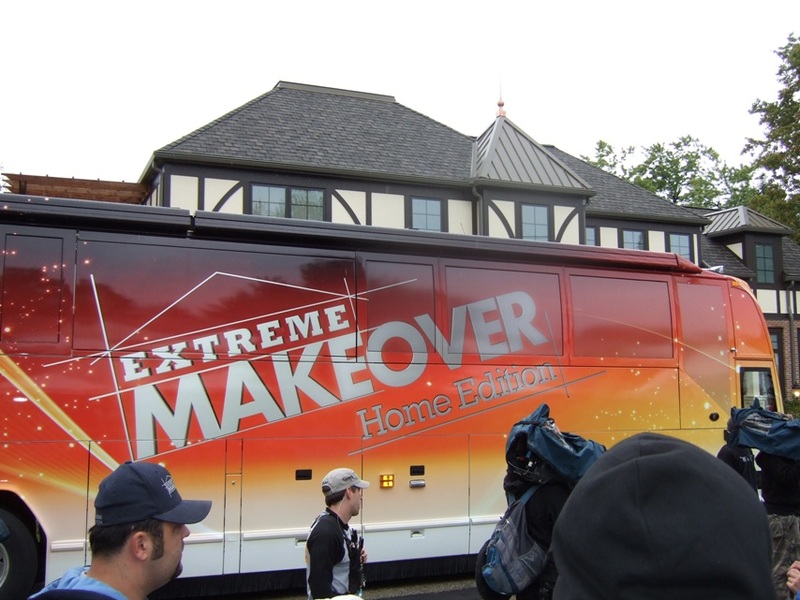 To top it all off, we have a television show called, “Extreme Makeover: Home Edition.” They build a home in one week! That’s just not normal. So we have this mentality that I must have it now. If we can’t afford it, we grab our credit cards, buy now, and pay later. The temple took 7 years, not a week, to build. And Solomon didn’t “move that bus” when it was all done. The Bible tells us that WE are the temple of the Lord. He no longer resides in a building made by man; He resides IN man. He dwells within us and He asks us to treat our bodies like a temple to Him. And we have to be built, remodeled, cleaned up, etc. That isn’t going to happen overnight. This isn’t drive through Christianity. Just because I showed up to church those three times doesn’t mean that my temple is ready. It requires a bit more work than that. The temple took seven years to build. Let’s put some effort into building faith in our life. Let’s put effort into knowing Him more, making ourselves a temple that He would be pleased to dwell in. Have you ever worked in a hostile work environment? How about lived in a hostile home? It’s no fun. The word hostile means: unfriendly, opposed, or aggressively against. When you are in a hostile environment, you may feel scared or left out or even threatened. It is no way to live. The Gentiles knew the feeling of hostility. They were not allowed to worship God the way the Jews were. They hadn’t fulfilled the obligations of the law, therefore they could not commune with God. Once Jesus came on the scene, things began to change. He came for all mankind, not just a certain group of people. Paul was sure to preach this message. But here in the church at Ephesus, there were still divisions taking place. There were still Jews trying to convince the Gentiles that they didn’t quite measure up; they weren’t quite equal to God. This caused problems that needed to be corrected. Paul says in verse 14 that He [Jesus] Himself is our peace. He has made the two one. This seems like a strong enough argument, but Paul takes it farther. He doesn’t just say that the two, Jews and Gentiles, are now one. He moves into territory that would hit the Jews where it counted. He targeted the temple. There was great significance in the illustration that Paul used here. The dividing wall of hostility was not just a figurative expression – it was a literal wall. It was a barrier in the temple that divided Gentiles and Jews. 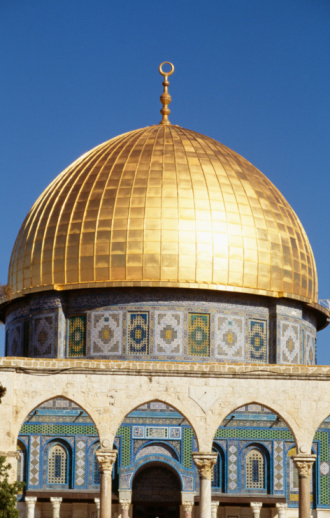 It was set up in order that Gentiles would be kept out of the most Holy places. On it the following words were inscribed, “Whoever is captured will have himself to blame for his subsequent death.” This seems pretty hostile to me! 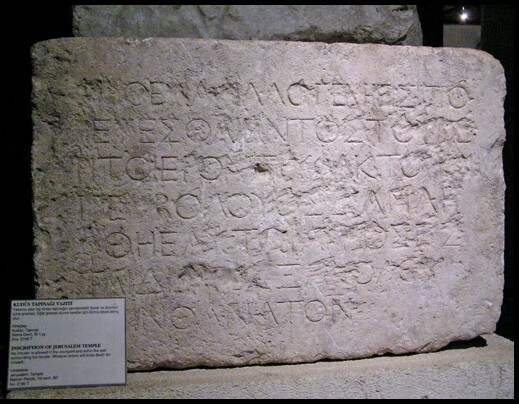 If a non-Jew was caught past these large inscribed stones, they were subject to death. Wow. This doesn’t sit too well with Paul, given the fact that Jesus came to make a way to God for all of mankind. So he tells them that Jesus has removed the dividing wall of hostility. It has lost its meaning, its significance, its purpose. It is no longer needed. This statement must have ruffled some feathers, I am sure. Paul was going after a sacred element of temple worship. He didn’t care though, because it was wrong. There is not a person more worthy to God than another. There is not one more holy or more deserving. There is not one who can draw closer to Him. Jesus opened it up. He eliminated the barrier so that all could come.